Automatically restart Confluence when it stops for any reason. Survive, crashes, memory leaks, non-responsive web pages and more. Download and install Service Protector, if necessary. 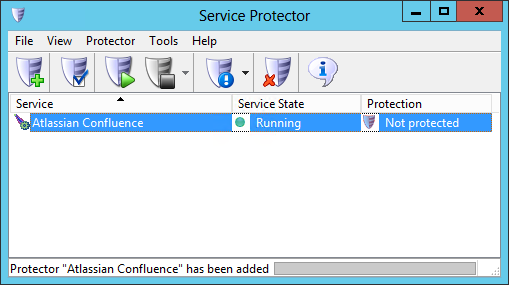 On the General tab, in the Service to protect field, select the Confluence windows service. It will be called Atlassian Confluence. You will notice a green circle beside the name if the service is already running (as was the case on our PC). If you find that Confluence occasionally crashes or hangs, click over to the Monitor tab where we will set up a failure detection script to tell Service Protector when it should restart Confluence. Follow these instructions to create the failure detection BAT file. We have called ours check-confluence.bat and placed it in the Confluence installation folder (C:\Program Files\Atlassian\Confluence\bin). Check the Whenever it fails a "sanity check" box. Click the ... button and specify the full path to the batch file you created. Specify how often to check. We recommend every 5 minutes, but you can check more or less frequently depending on your situation (and how much downtime you can afford). Check the At the following times box. Specify the day and time to restart the service. We have chosen every day at 2 AM. Note that you can choose to reboot the server at that time if you like. Click the OK button to record the time. Click the Save >> button. 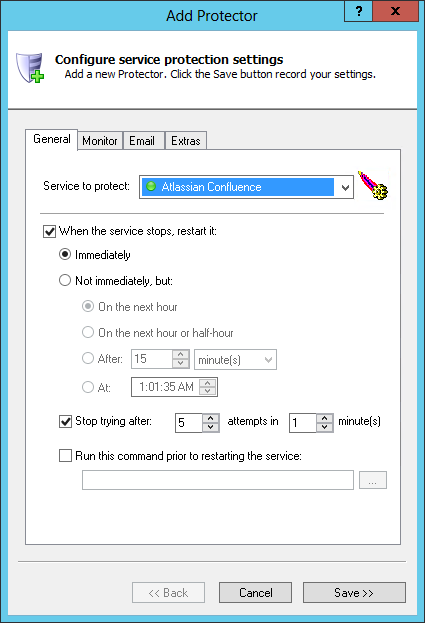 In a few seconds, an entry for Atlassian Confluence will show up in the Service Protector window. 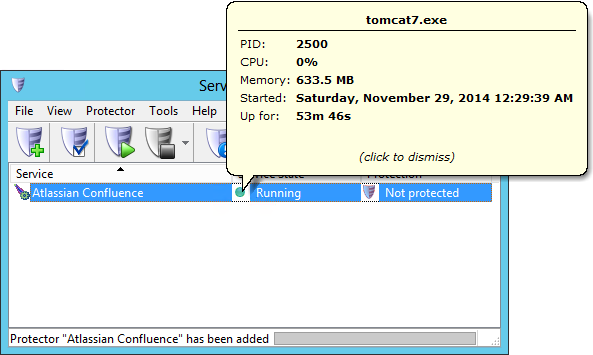 The Confluence windows service is probably already running but it is not yet being protected by Service Protector. That's it! 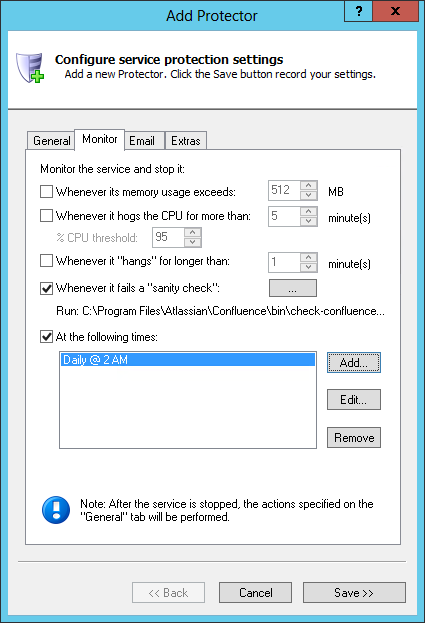 Next time your computer boots, Confluence will start up automatically (as normal) and Service Protector will start monitoring the service to quickly restart it if it stops for any reason. 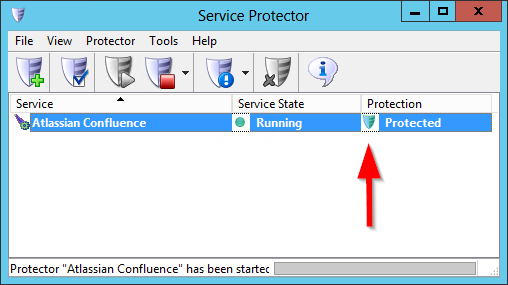 We encourage you to edit the Confluence entry in Service Protector and check out the many other settings that may be beneficial to your environment. For example, send an email when the service fails, watch out for the service getting stuck starting or stopping, and much more. 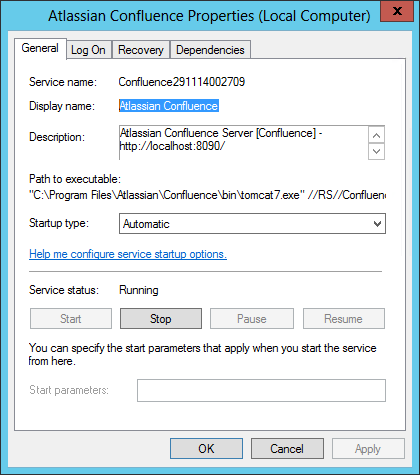 Trouble protecting the Confluence Windows Service? 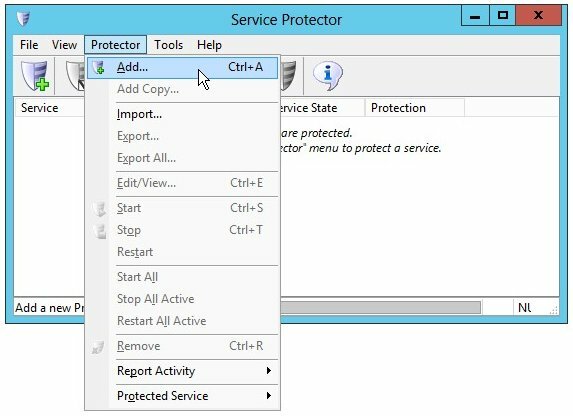 Consult the Service Protector FAQ for answers to commonly asked questions and troubleshooting tips. Peace of mind for your important Windows Services!